Only ONE WEEK until THE BLUE NOTE OPEN! 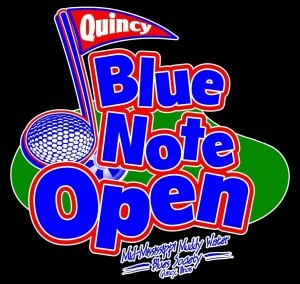 Hey folks, just a quick update on the status of the 2010 Blue Note Open-Quincy’s original Winter Indoor Golf Event. We’re already over halfway to filling this event up with teams. BUT–you can still get in…Get your team entry forms filled out with your entry fees, and get them in the mail EARLY THIS WEEK. Don’t mail them in on thursday or friday–just get to Turner Hall just before noon on Saturday to get entered. We generally have a few spots left on Saturday for some last minute teams, call Linda G. @ 217-440-3393 early Friday evening, or Saturday morning to confirm we’ve got a spot left for your team. Also, the Blues Society will be selling chicken and sausage Jambalaya at Turner Hall-in recognition of it being Mardi Gras! Don’t forget to wear your best golf duds, and let’s have a blast! See you at the Open! The 2010 BLUE NOTE OPEN is coming! To refresh everyones memory, or if you know little about the event, it is teams of four golfers, (with one MANDATORY desiginated driver-or a separate driver, per team), taking on 9 holes of indoor golf at nine different establishments. The start and finish point is at Turner Hall. THIS EVENT FILLS UP VERY QUICKLY, and we can only handle 80 Teams Maximum, and we would strongly recommend pre-payment. Our pre-paid teams are obviously in the event first, and then we’ll take the remaining allowable number of teams and their payment on the day of the event, if we have any room left. What are we playing for? First-more than anything, for the fun of the whole afternoon. Second-There will be a cash prize for the team, and individual with the lowest score. Also-teams are encouraged to wear their best golfing costumes, as we will award prizes also for the best dressed team, and also for the the highest individual scoring golfer. We as an organization will be using funds from this event to help out some local school music programs, and to revive some other events locally in the future. Please scroll down this Homepage for the team registration form, and also note that we have changed the scoring of the holes, to make things more interesting this year. Establishments included this year include: Turner Hall, The Blind Pig-12th & Lind, North End Tavern-24th & Cedar, Heartland Saloon-10th & Maine, Hooey’s-633 N 12th, The Club Tavern-1023 N 10th, North Side Boat Club-200 S Front St, Cedar Club-20th & Cedar, and The Dock-Front & Cedar St. We look forward to seeing you at The Blue Note Open! Instructions for completing the form, payment, and mailing are included within. Enjoy the 2010 Blue Note Open!